Willy is lost. New sights and new places sometimes seem strangely familiar, but he doesn't know why. Unexplainable flashbacks taunt him. Stolen by gypsies at a tender age, Willy now longs to discover who he is and where he belongs. A frightening journey by train to a new school will reveal more than he can imagine. Fragmented memories that haunt him in the present will lead to secrets of his past. If only he can remain strong and courageous through the passage! A dramatic tale of loss, sacrifice, hope and redemption awaits you. I was just drawn to this story. It is my favorite of the eleven I have listened too. Just so touching. From Anonymous of Brookfield, Missouri on 12/5/2018 . I have enjoyed the stiory very much. I have listened to it several times. This is a great story with lots of suspense that kept us guessing the ultimate outcome. Very enjoyable. I grew up listening to Lamplighter stories and continue to this day! The stories are so fun and full of amazing life lessons. 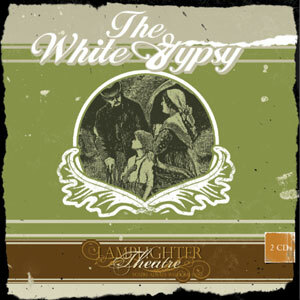 The White Gypsy is my personal favorite! Another great story from Lamplighter! Great acting. The sound effects make you feel like you are right there during the whole time!